What is TICK Stack ? 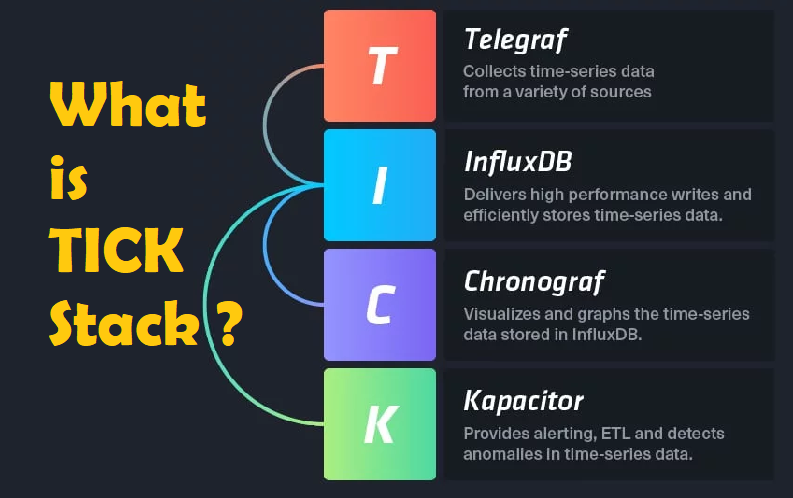 The TICK Stack is an acronym for a platform of open source tools built to make collection, storage, graphing, and alerting on time series data incredibly easy. The “I” in TICK stands for InfluxDB. InfluxData provides a Modern Time Series Platform, designed from the ground up to handle metrics and events. InfluxData’s products are based on an open source core. This open source core consists of the projects Telegraf, InfluxDB, Chronograf, and Kapacitor—collectively called the TICK Stack. high performance and efficient database store for handling high volumes of time-series data. Recommended: InfluxDB | Installation | How To Use | Time Series Database ? TICK aligns well with many potential use cases. It especially fits uses which rely upon triggering events based on constant real-time data streams. An excellent example of this would be fleet tracking. TICK can monitor the fleet data in real-time and create an alert condition if something out of the ordinary occurs. It can also visualize the fleet in its entirety, creating a real-time dashboard of fleet status. IoT devices are also a strong point for TICK. Solutions that rely upon many IoT devices combining date streams to build an overall view, such as an automated manufacturing line, work well with TICK. TICK can trigger alert events, and visualize the entire status of a production line easily.